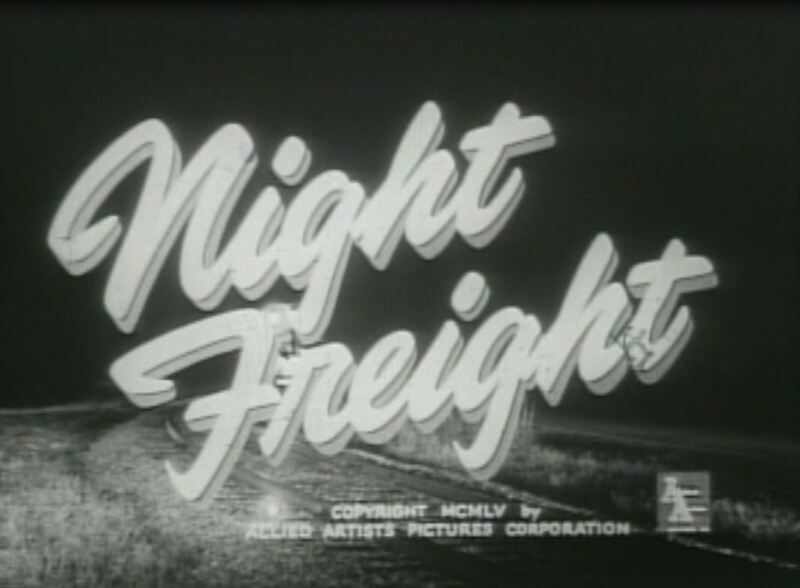 Night Freight is a B&W B movie, train-laced from start to finish. 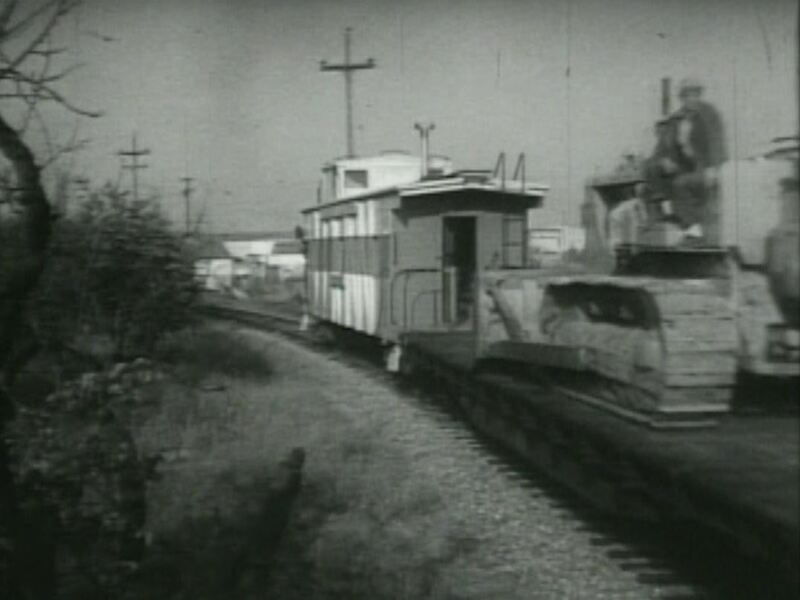 Starring a couple of General Electric 70 ton switchers (#600 & #602), this picture’s exteriors were filmed on the Modesto & Empire Traction Company Railroad in Modesto, California. 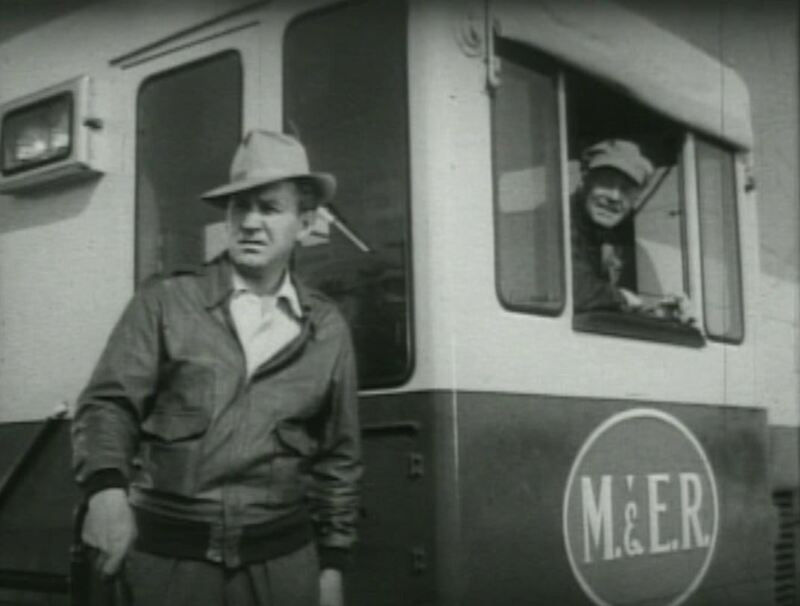 Forrest Tucker plays Mike Peters, the M&ER Railroad general manager/troubleshooter. 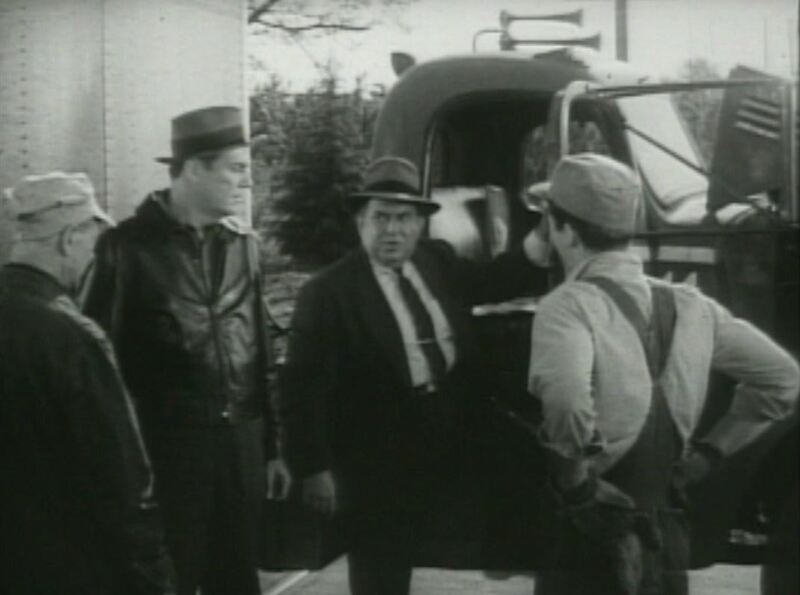 His rival is the local trucking company owner, Haight (Hate, get it?) played with wonderfully slimy menace by Thomas Gomez. 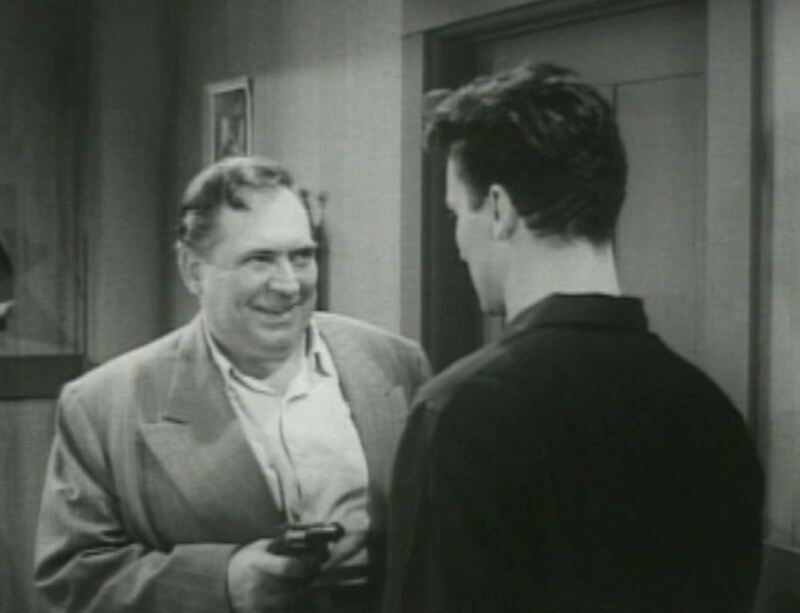 Movie fans may remember Gomez playing the gangster Curly in Key Largo. 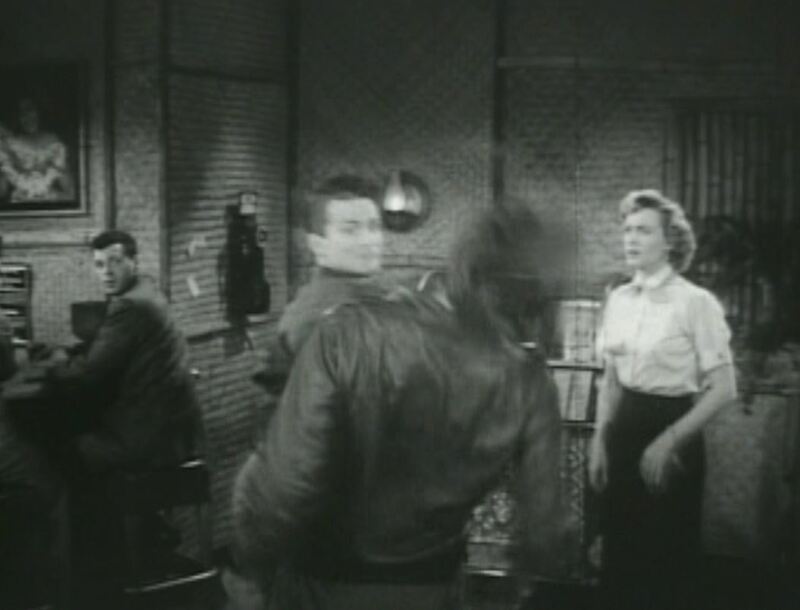 To further queer the mix, Mike’s alcoholic brother Don (just back from the war), is dating a little cocktail waitress Wanda (Barbara Britton) — who soon takes up with Tuck in a messy love triangle. Let’s roll and check it out! 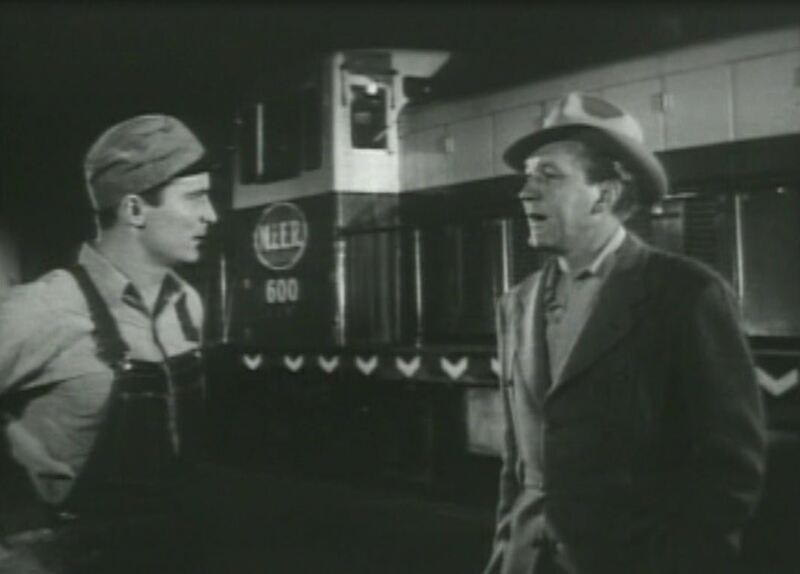 M&ER #602 is stopped by a red fusee on the tracks…placed there by one of the bad guy’s henchmen (can’t do nothing without henchmen). 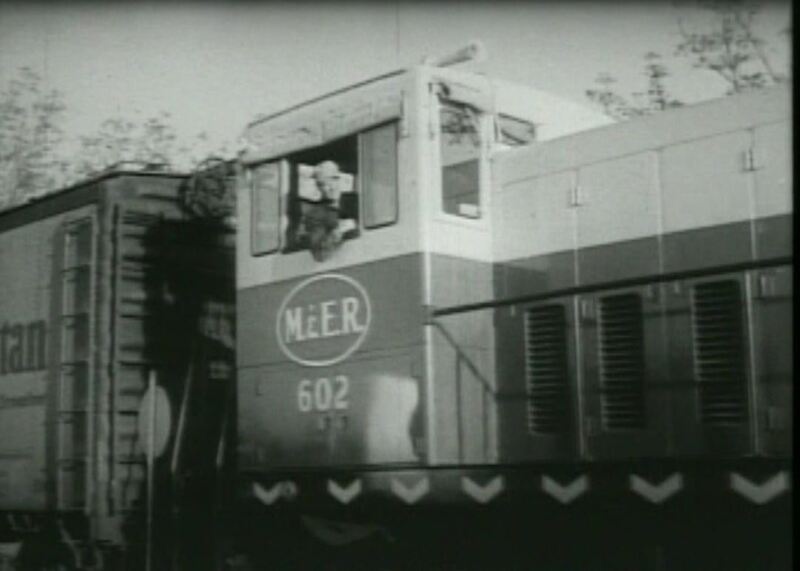 The movie opens with M&ER #602 rolling along pulling a wonderful string of Santa Fe Railway “billboard” refrigerator cars. 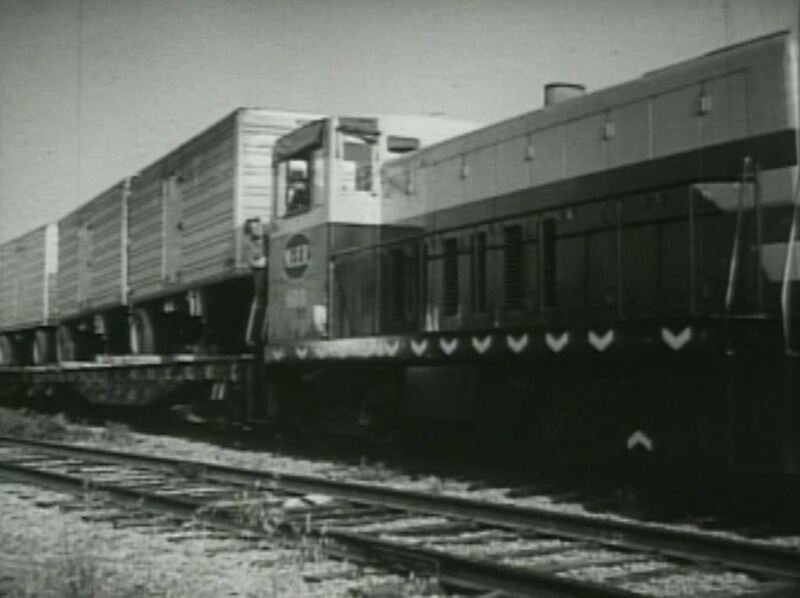 Trailing the reefers is an outside-braced Tidewater Southern caboose; What’s this? 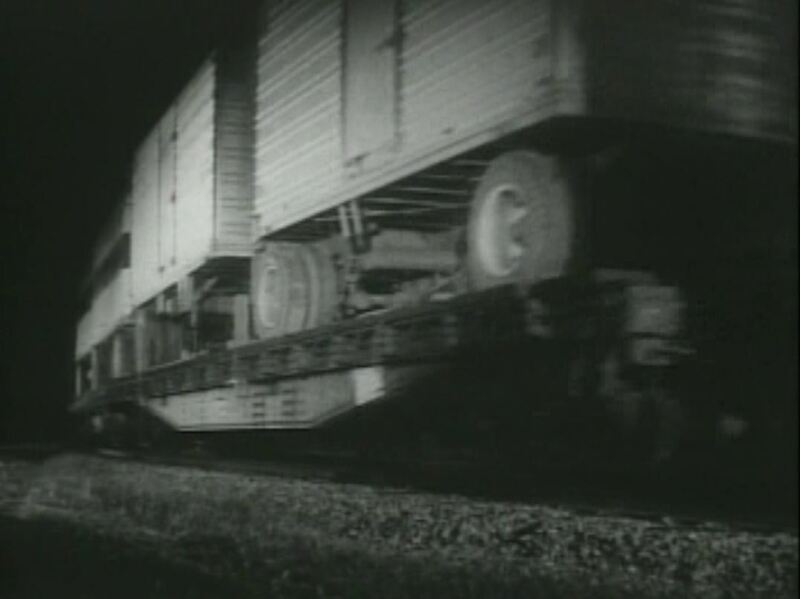 A truck has stalled on the tracks! 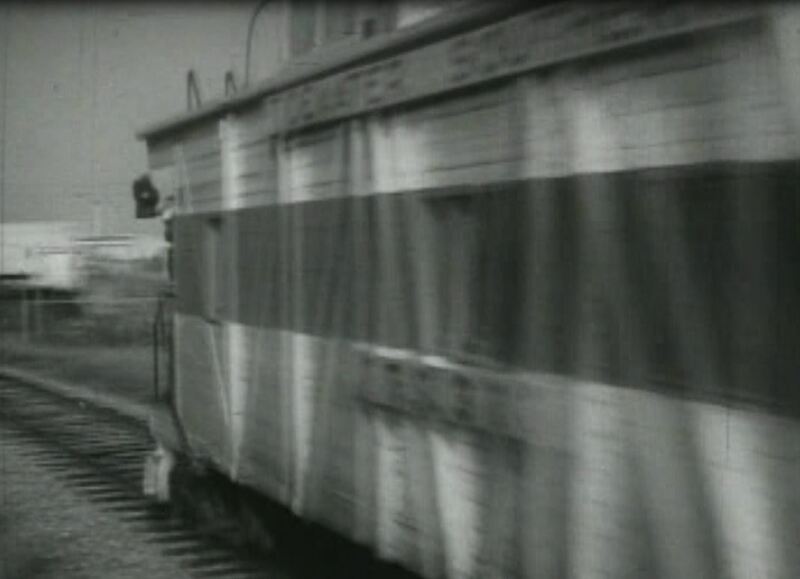 Stop the train! 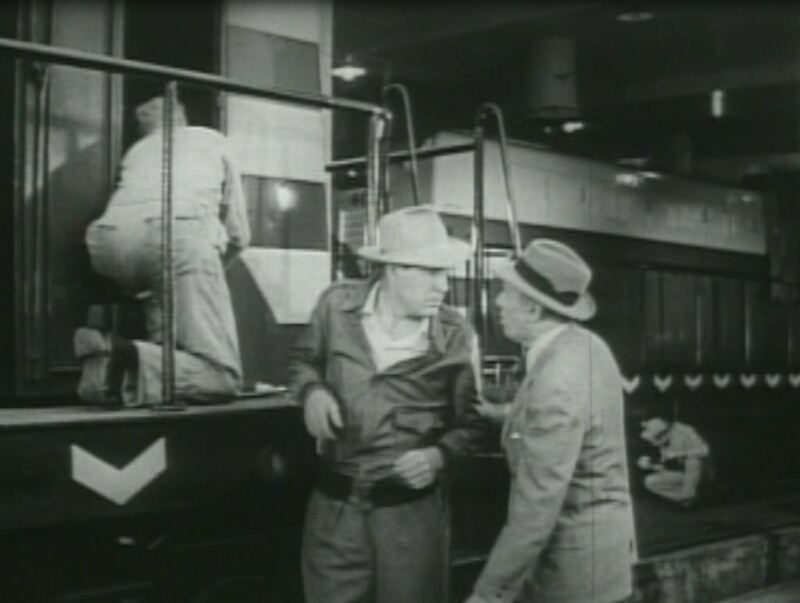 Ahh..it’s just Haight “accidentally” breaking down to deliver the train crew a stern rebuke…tell Mike to lay off! 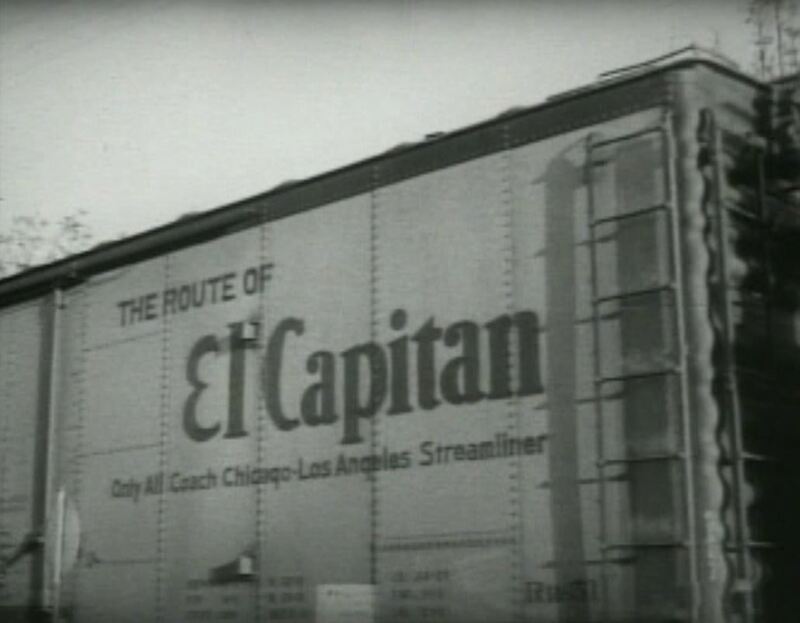 ; a good look at AT&SF “billboard” El Capitan reefer. 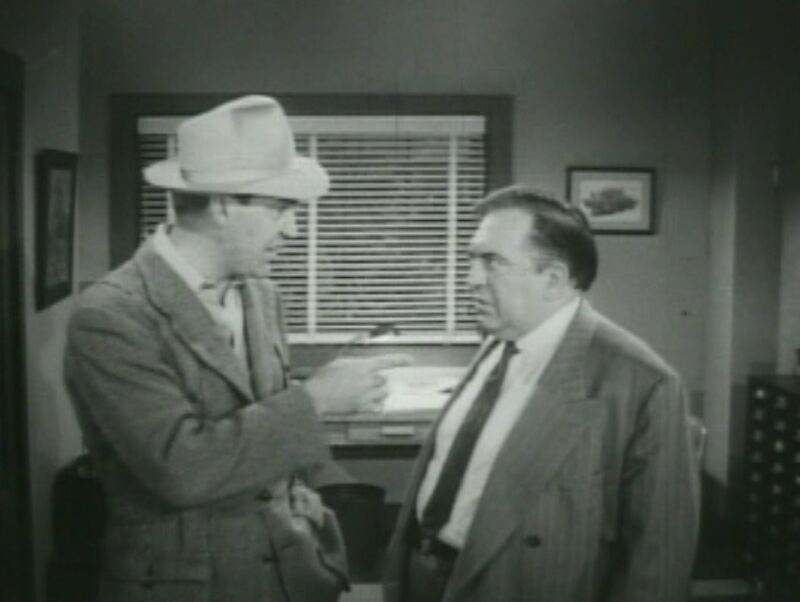 Later that night, Don (Keith Larsen) tells brother Mike (Tucker) what happened as M&ER #600 looks on; Mike heads over to Haight’s office and tells him off. 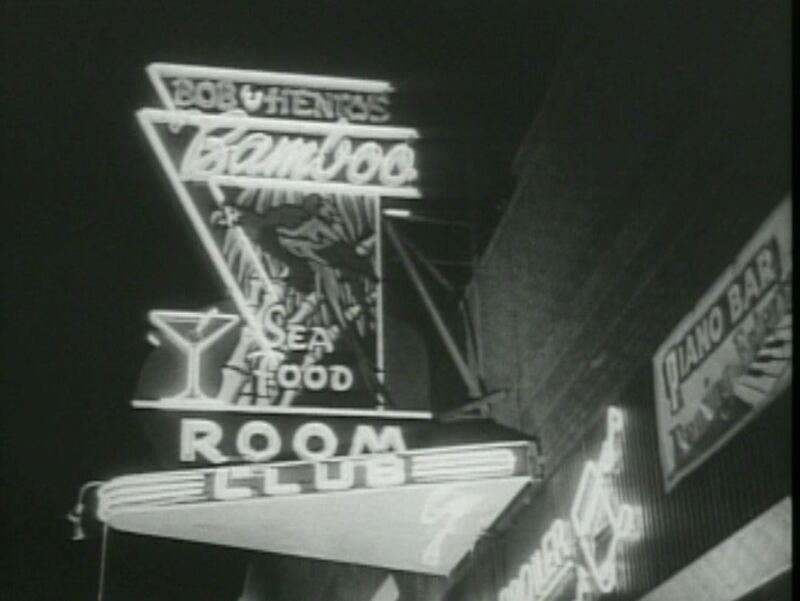 When they’re not running trains, the railroad personnel seem to spend a great deal of time at Bob & Hento’s Bamboo Room and Club (featuring martinis, seafood and fried parrot on a stick); Tuck moves right in on brother Don’s girl. Caught! 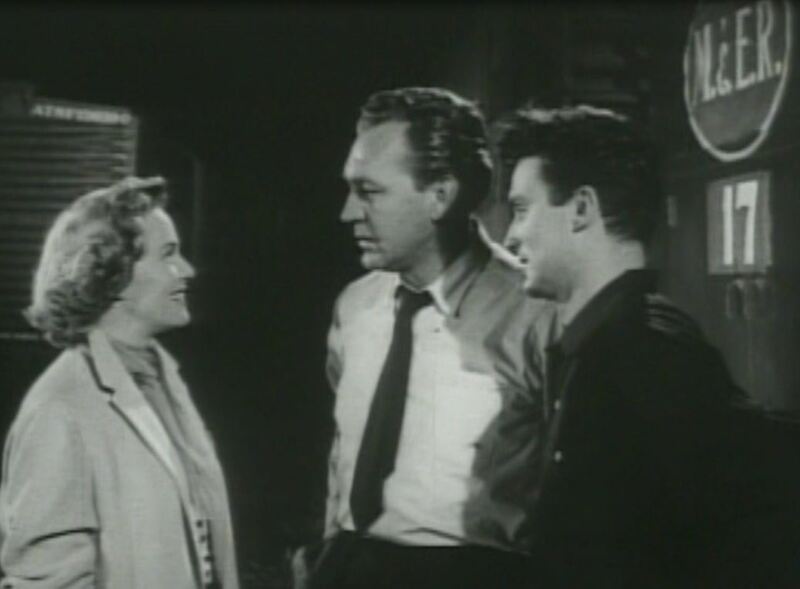 Don witnesses this tender moment, then dispatches Mike with a right haymaker. 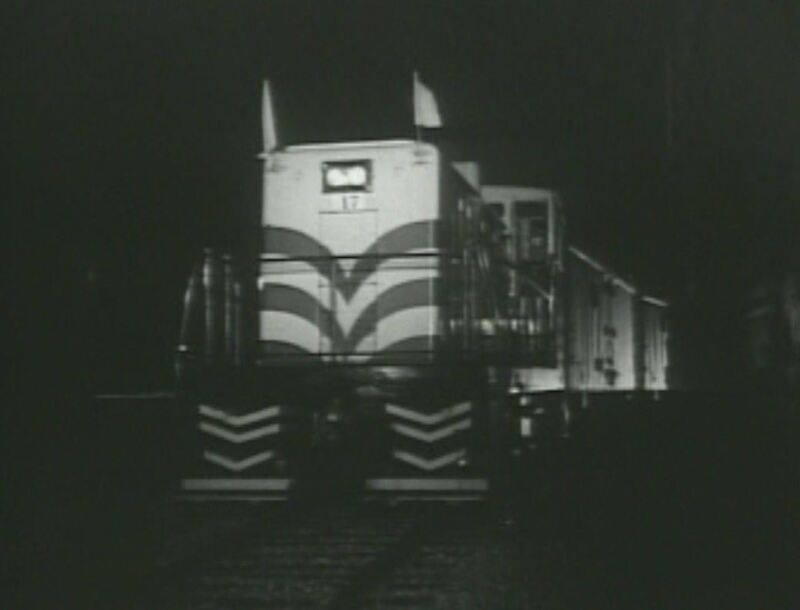 Okay, back to the trains. 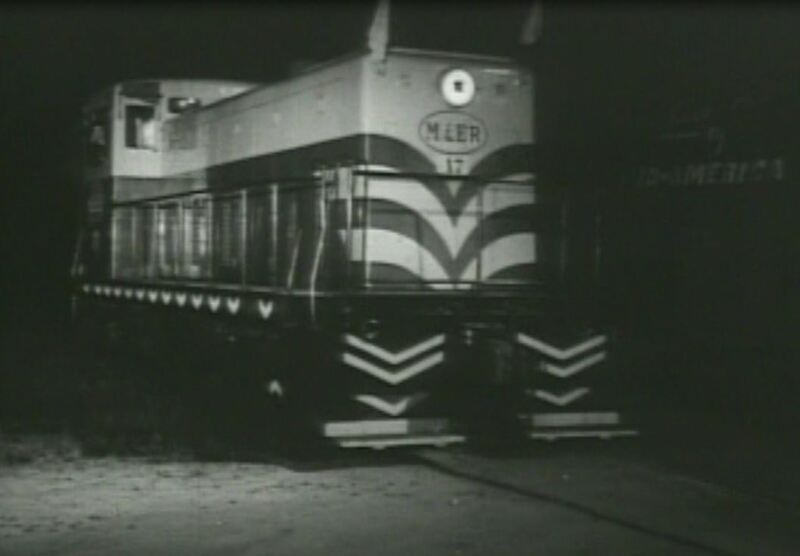 Mike in the maintenance shed with two GE 70 tonners; Supervising the loading of piggyback trailers at a “circus-style” ramp. 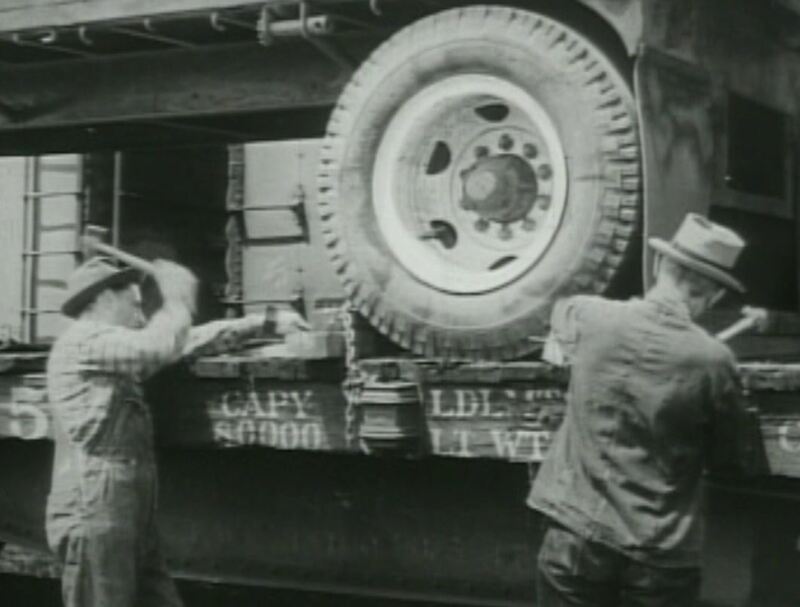 Hammering away at blocks to keep the trailers from moving; piggyback trailers rolling along. 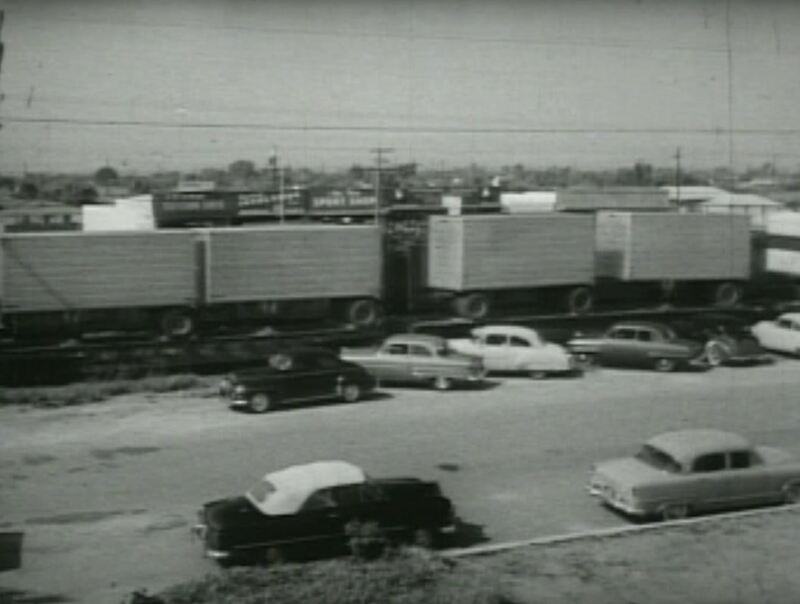 Look at all those old cars trackside! 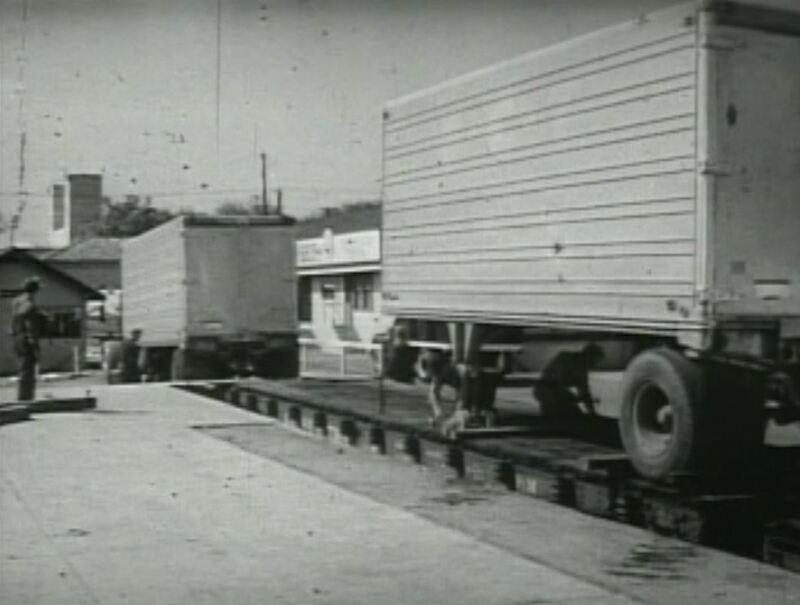 Mike’s idea of running trailers on flatcars (TOFC) is now seriously cutting into Haight’s trucking business. Time for nefarious deeds. 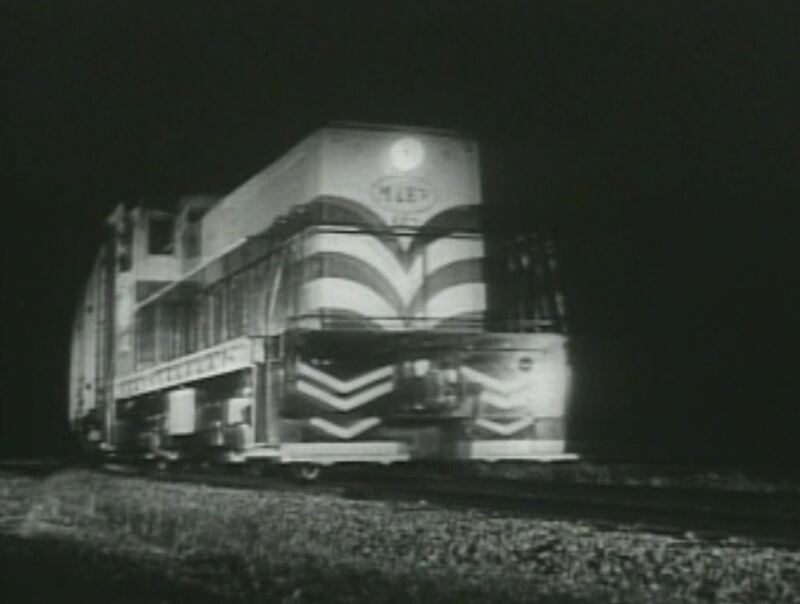 Night Freight led by M&E #602 rolls the piggyback through the dark. 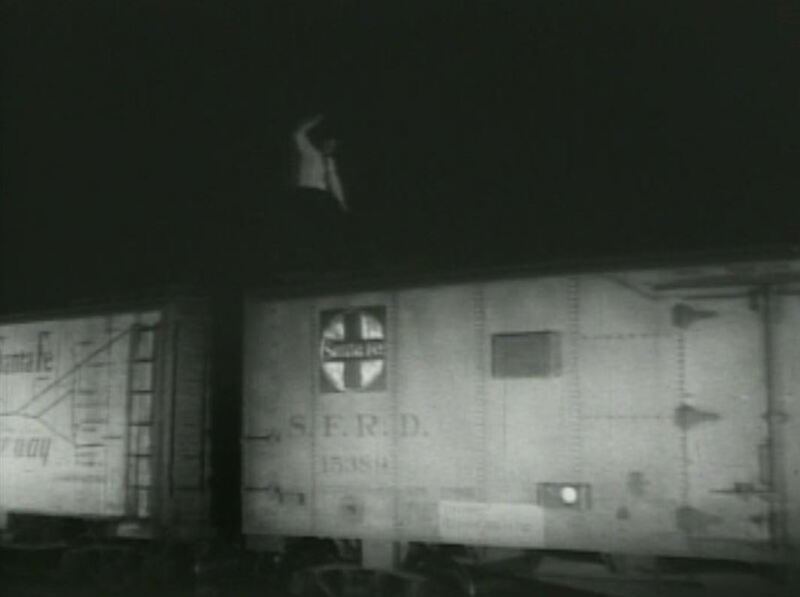 As previous mentioned, Haight sends out his henchmen to delay the train by placing lit red fusees on the track. This delays the trains so much, it can’t meet the customer’s schedule and be delivered in a timely manner. 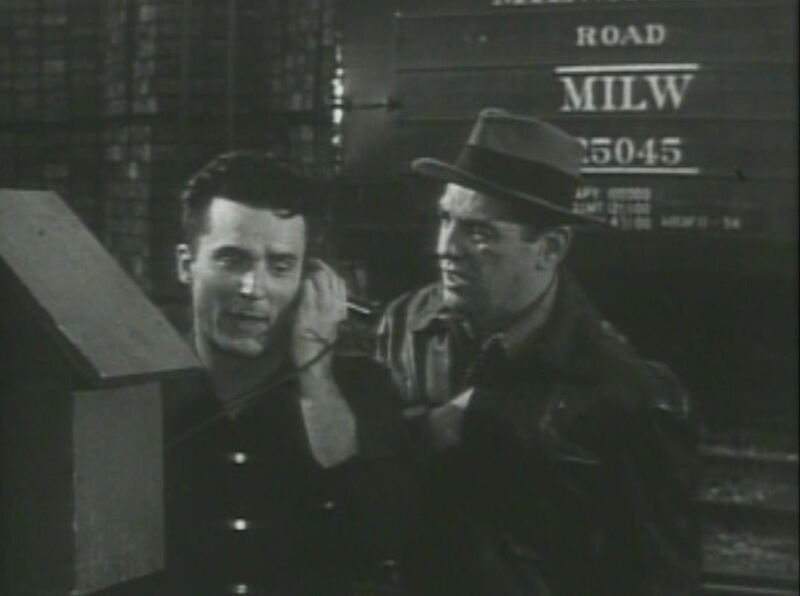 Finally Mike rides along in the cab and after a few red signals he orders the engineer to run through them. 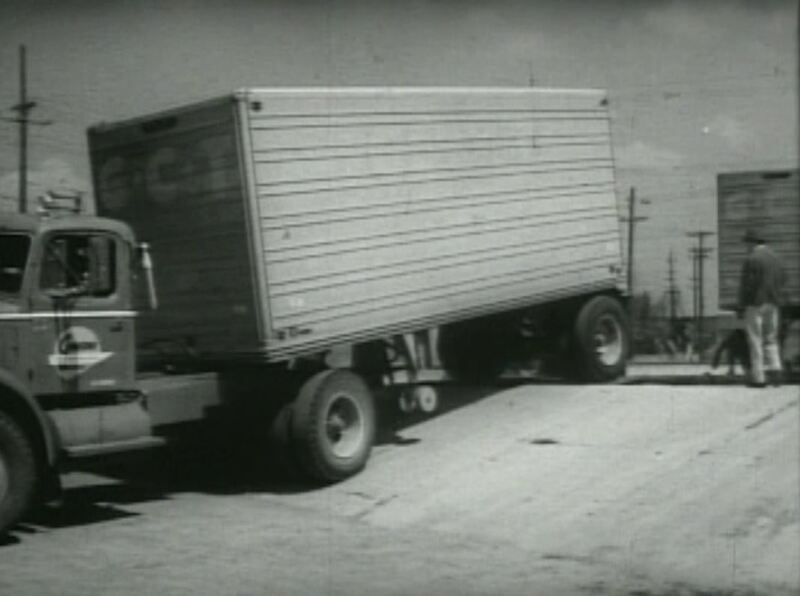 The cargo is delivered on time. 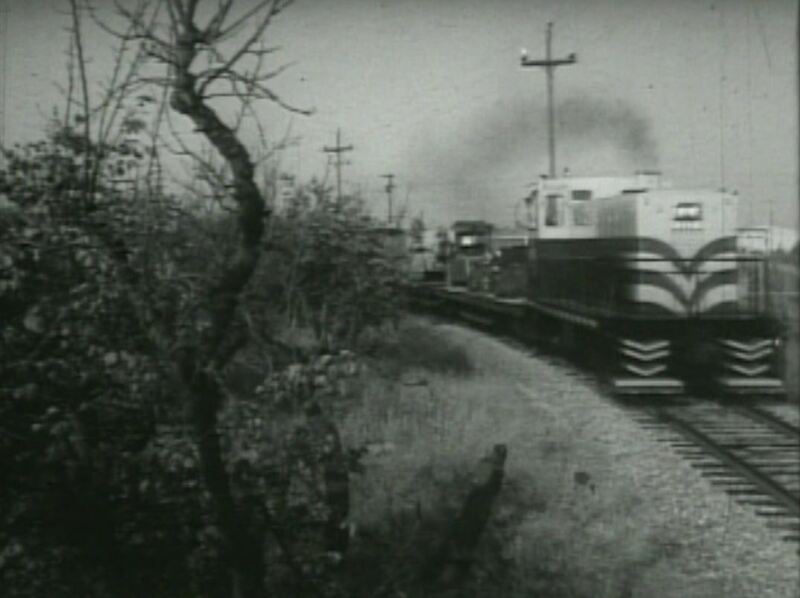 A mysterious wreck blocks the line. 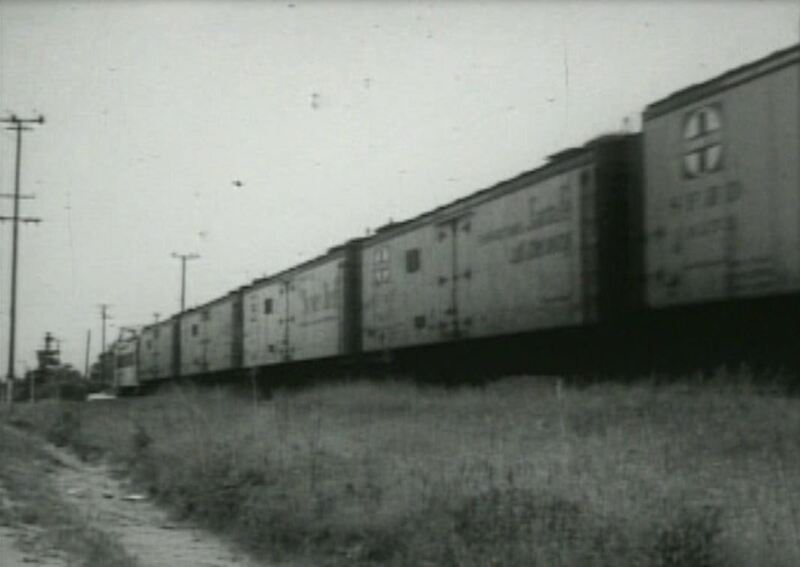 The piggyback train sits in the siding as a wreck train speeds by. 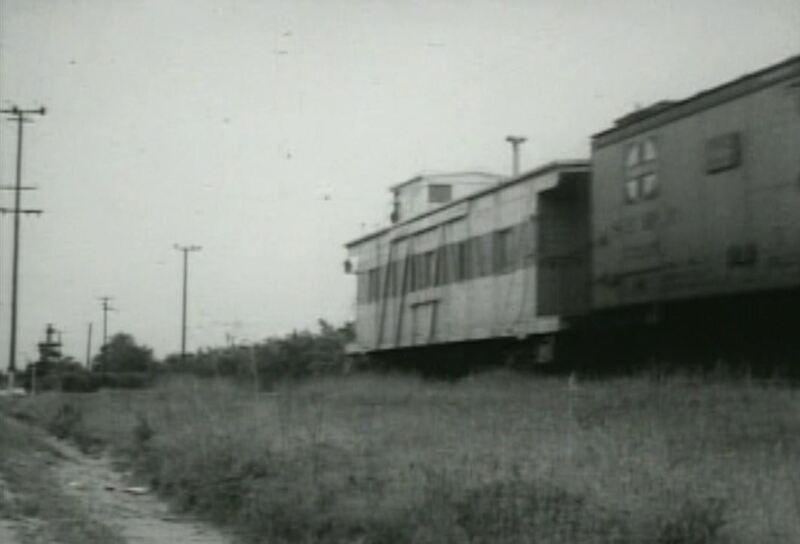 There’s that Tidewater Southern caboose again. 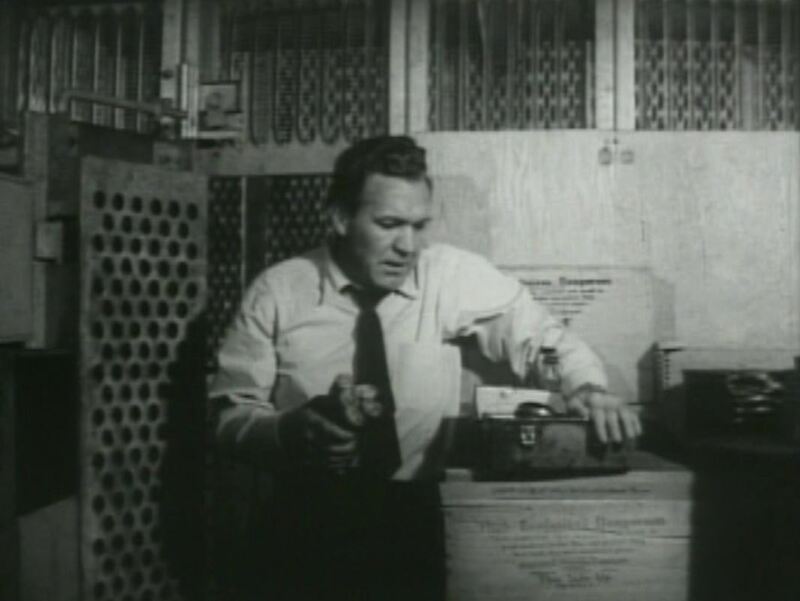 A smirking Haight holds Don at bay in the trucking company offices; Don phones for help — Haight has placed a bomb on the Night Freight! 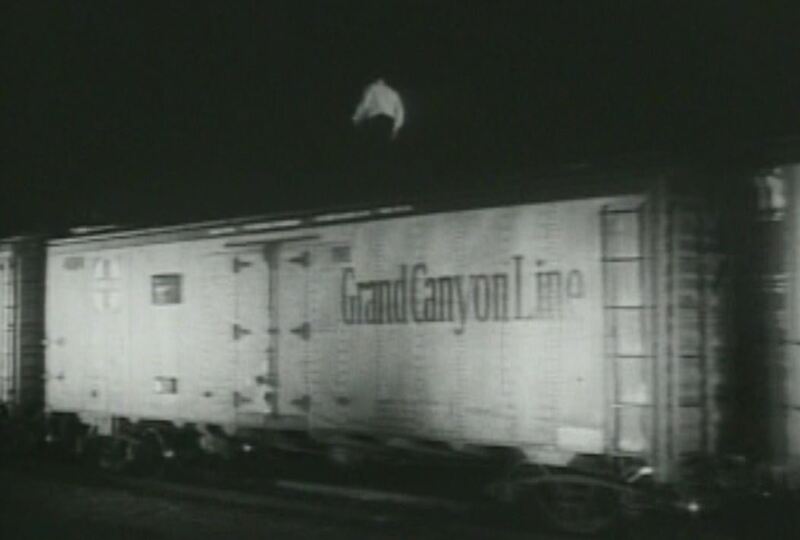 Putting aside their numerous personal differences, Don and Mike team up to move the bomb train (led by hastily-renumbered #17) away from town; Tuck leaps from car to car — here’s a dandy view of a “Grand Canyon Line” AT&SF refrigerator car. 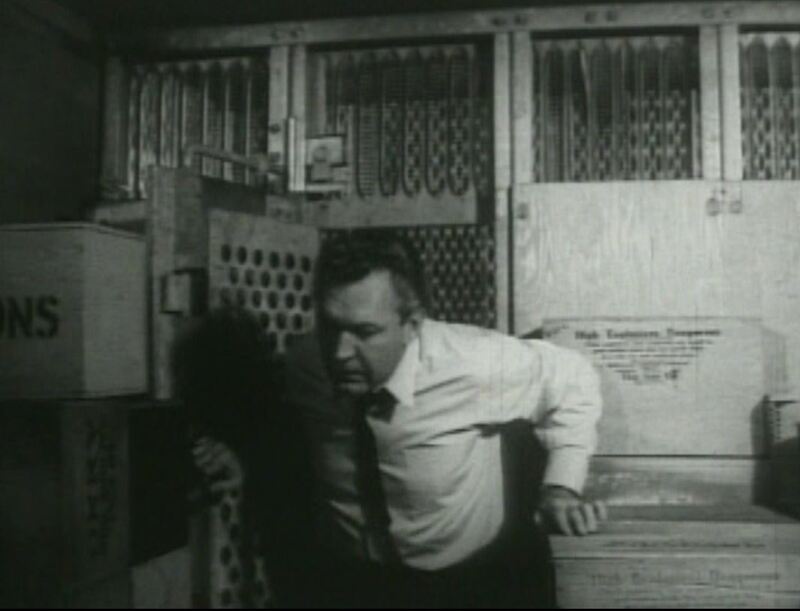 Mike opens an ice hatch on top of a reefer; then crawls down inside the car. 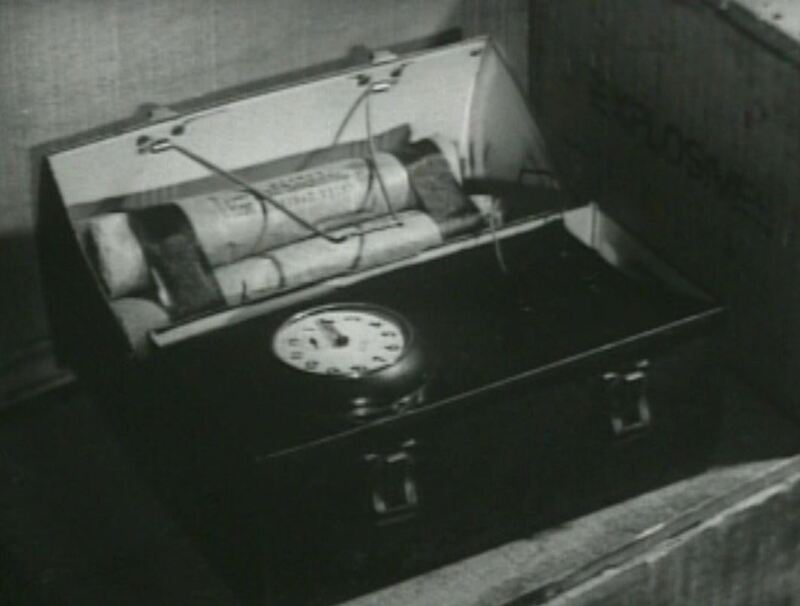 Lunchbox bomb! 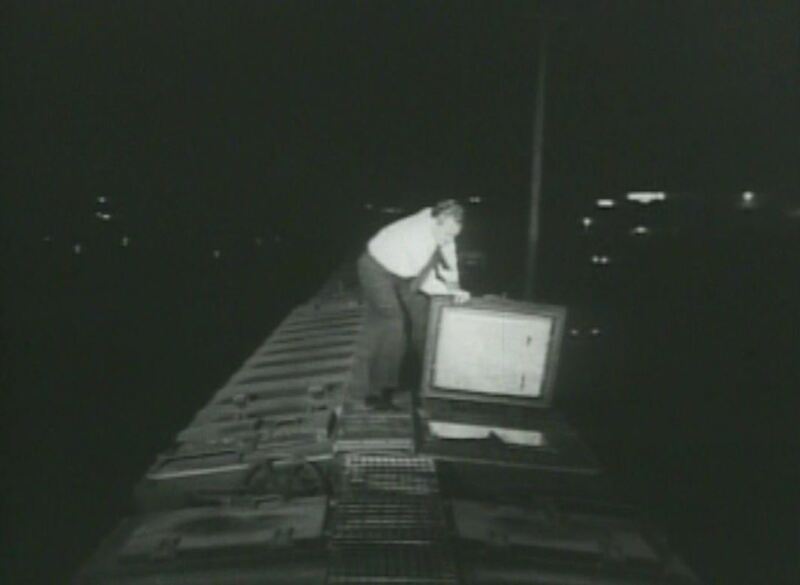 Tuck yanks out the wires and saves the day! 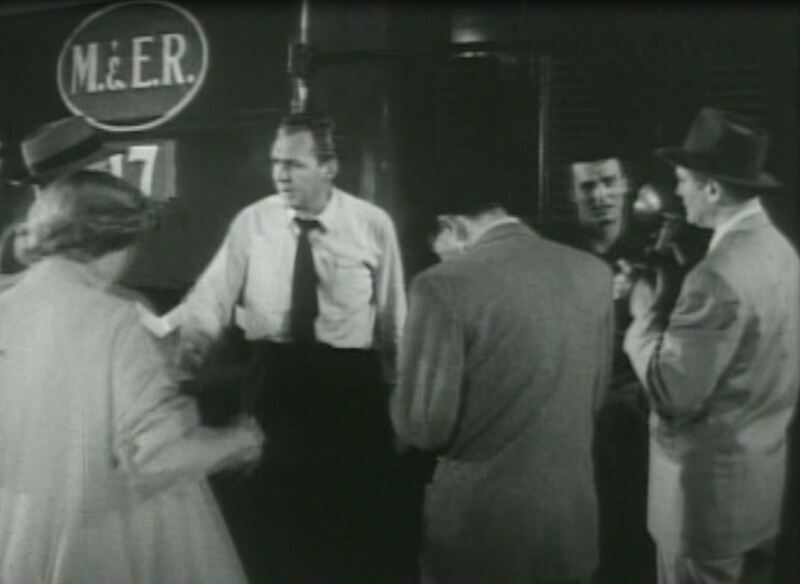 M&ER #17 comes to a stop as the reporters crowd around for pictures. 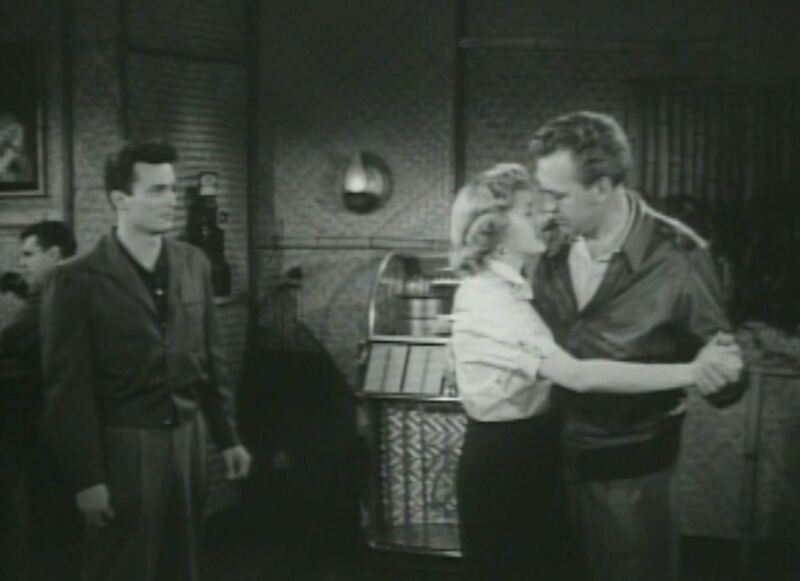 We’re all friends now — Don and Mike reconcile and Forrest Tucker gets the girl as #17 idles happily in the background. 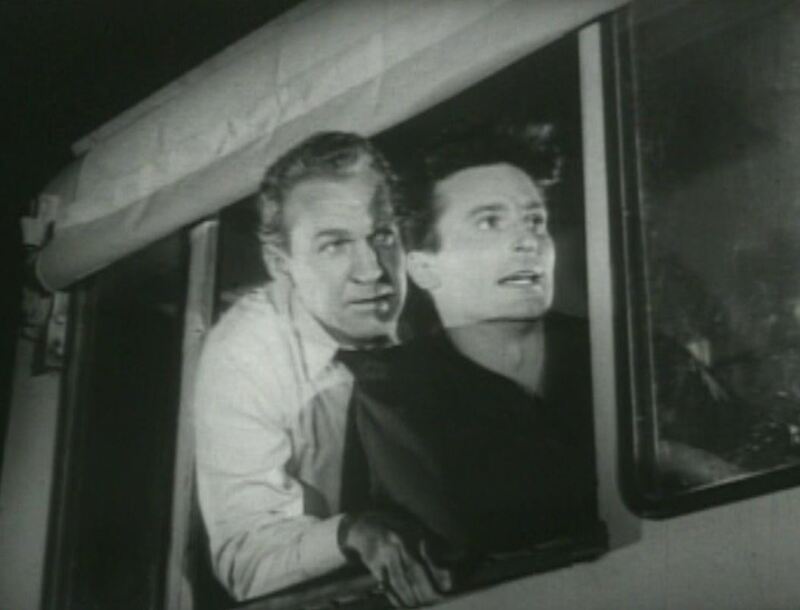 For a B picture, Night Freight was pretty entertaining – Thomas Gomez really chewed the scenery in his scenes and Keith Larsen played the jilted drunk to perfection. 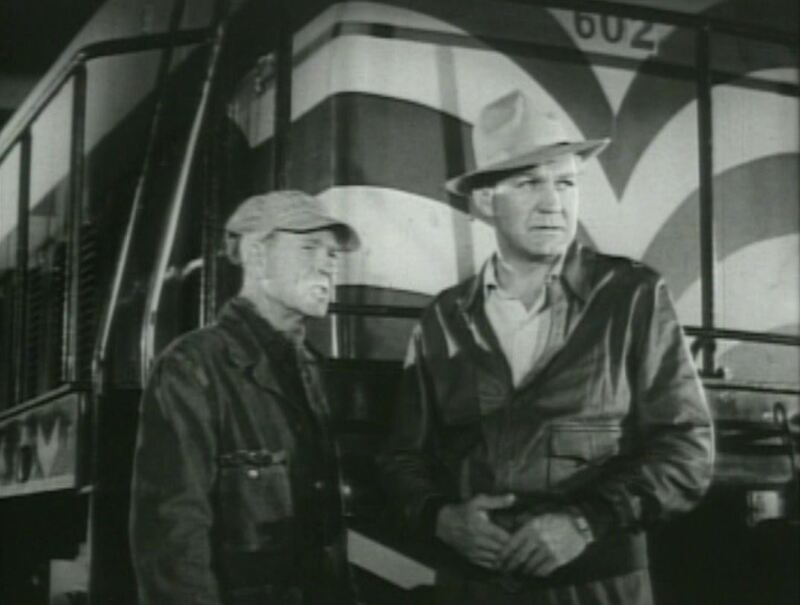 Add he-man Forrest Tucker and tomato Barbara Britton and you’ve got yourself a winner. 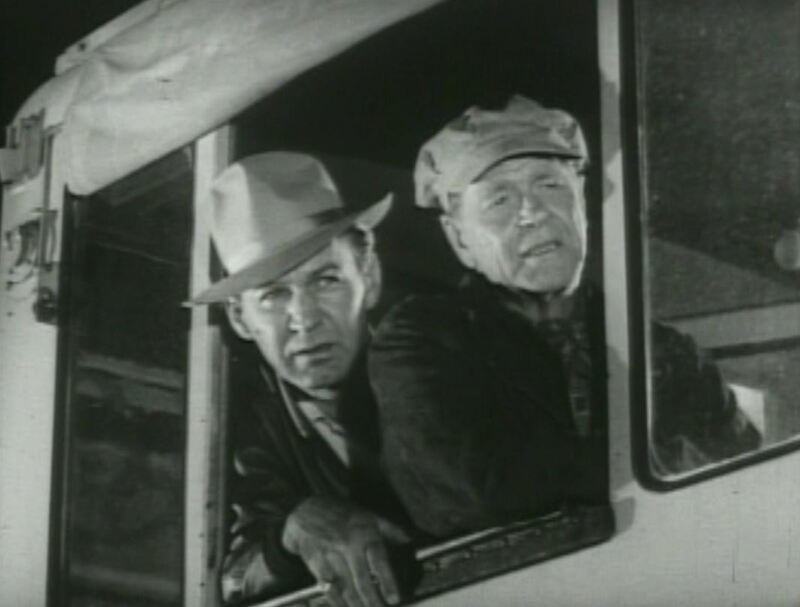 F-Troop! Hiiiiii-yoooo! 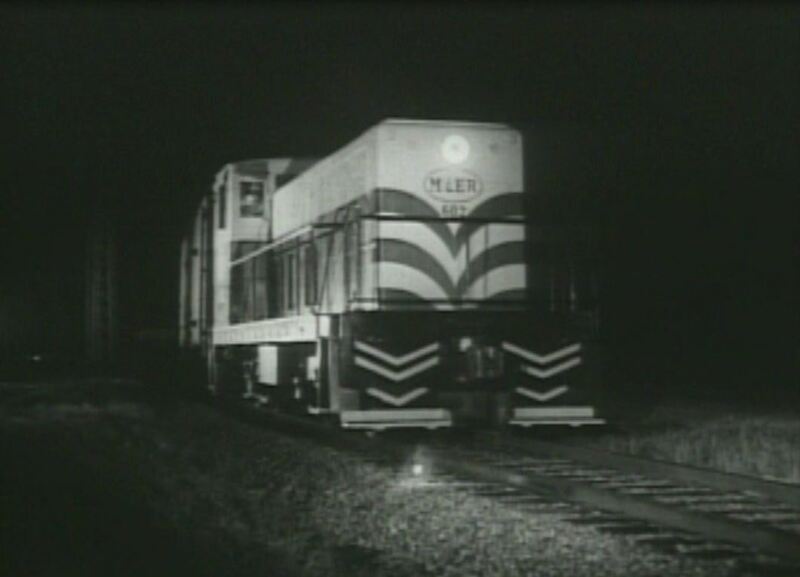 This entry was posted in Uncategorized and tagged Allied Artists Picture, Atchison Topeka and Santa Fe Railroad, Billboard refrigerator cars, El Capitan passenger train, F-Troop, Forrest Tucker, General Electric 70 ton switcher, Key Largo, M&ER Railroad, Modesto & Empire Traction Company Railroad, Modesto California, Night Freight 1955, Thomas Gomez, Tidewater Southern Railroad. Bookmark the permalink. 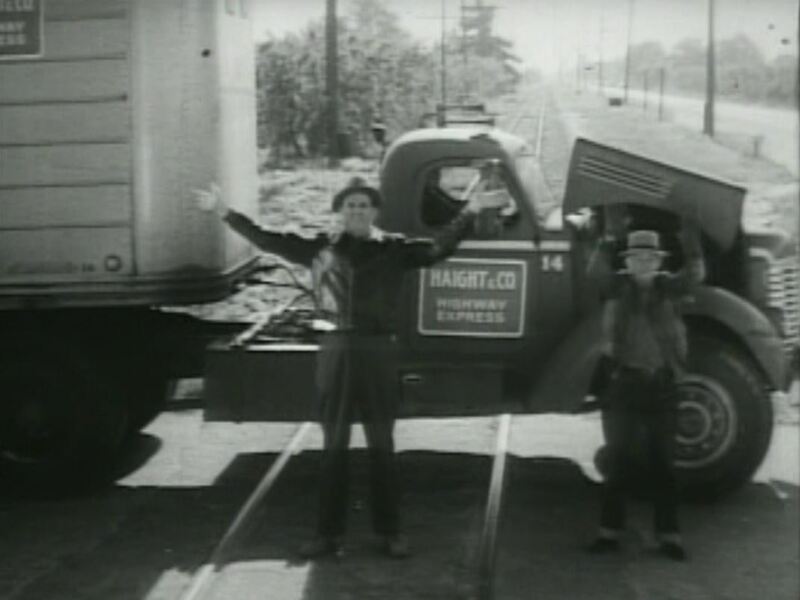 I think this site is Fantastic….great job…have Night Freight on VHS..they must of spent a whole $50.00 making the movie…dumb acting all around..except for the Trains….